Parliament is advertising for a new Black Rod to replace Lieutenant General David Leakey, who is retiring. 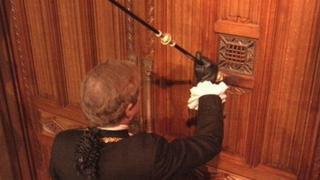 Black Rod is best known for the State Opening of Parliament, knocking on the door of the House of Commons to summon MPs for the Queen's Speech. As well as organising ceremonial events, Black Rod manages a team of 30 staff involved in the day-to-day running of the House of Lords. The successful applicant can expect to earn up to £93,000 per year. The famous image of Black Rod has its origins in a tradition dating back to the Civil War. Black Rod summons MPs to the Lords to hear the Queen's Speech but has the door to the House of Commons slammed in his face, and has to knock three times to gain entry. He is the Monarch's representative in the House of Lords and the routine is symbolic of the House of Commons' independence from the Crown. The vacancy is being advertised to external applicants as part of an open recruitment process. However, most previous holders of the post have come from a military background - and current Black Rod Lieutenant General David Leakey, who was appointed in 2011, was no exception. The closing date for applicants is 10 October.